Talk about combining hobbies that seems to be not very related - CosTaBa 2019. CosTaBa means COSplay TAttoo and zumBA. This is the first time that we saw an event combining these elements but judging from the way it looks, seems like this is something interesting. CosTaBa 2019 will be on January 20, 2019 at Brgy. Calo Elementary School in Bay Laguna. It will be from 4PM to 7PM. There will be lots of things to do including a cosplay competition, Tattoo contest and Zumba. Registration for each of the contest is Php300.00. For the COSPLAY the prizes are Php5K, Php3K, and Php2k for the 1st place, 2nd place, and 3rd place respectively. We are looking for a set of rules for the cosplay contest but it seems that it is not posted. 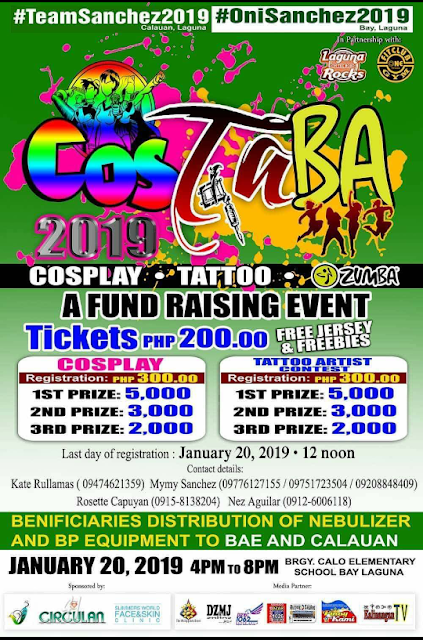 FOR ZUMBA, you need to buy tickets of ZUMBA worth P 200 in order to join the event on January 20, 2019. Prizes are Php5K, Php3K, and Php2k for the 1st place, 2nd place, and 3rd place respectively. For more details please visit the CosTaba 2019 Facebook page.